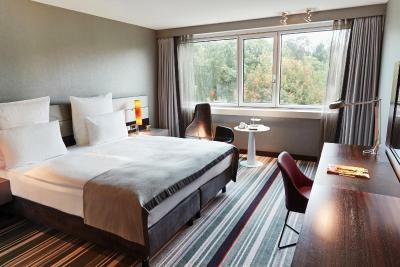 Lock in a great price for Steigenberger Airport Hotel Frankfurt – rated 8.7 by recent guests! The rooms were spacious and clean. Enough room space for the kids and beds were comfortable. The airport shuttle service was excellent. We have stayed here in the past and have enjoyed the upstairs pool as well. Would come back again for sure. The hotel was perfect in virtually every way. However, I was not apprised of the manner in which lighting was attained until I asked and was told that the room key had to be inserted. It would have been nice to know that upon checking in. 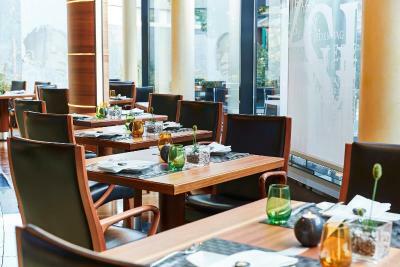 One of the best choices near the Frankfurt Airport. Free 24/7 shuttle. Rooms super clean and cozy. 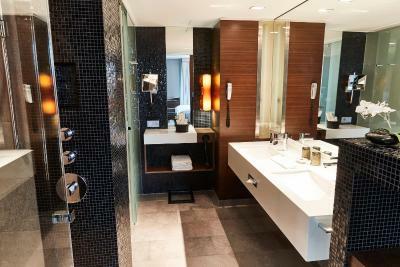 Modern and well-equipped bathroom. Good value for the convenient location. Highly recommended! 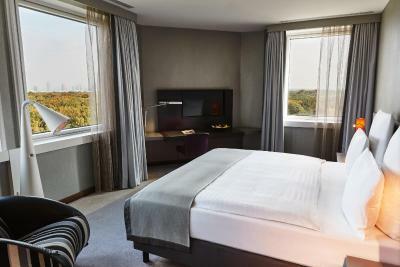 Location was great, near to the airport, nice spacious room, clean and staff where very helpful. 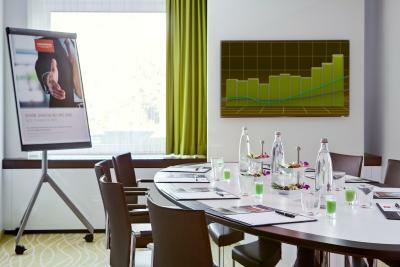 Very nice executive suite with modern facilities and the best shower. I loved the convenience of being a shuttle ride away from the train station and airport. The hotel felt upscale and at the same time comfortable. I slept well in the nicely appointed and spacious room. Kudos for linens! I am always grateful for nice sheets and towels. Stay here for a stress-free last leg of your journey and get right to the airport without a worry. Breakfast is really good. Executive tower rooms are still good. The bed was super comfortable and the staff were so kind and helpful! Loved the executive wing. Room was large and very comfortable. Bathroom was exceptional. 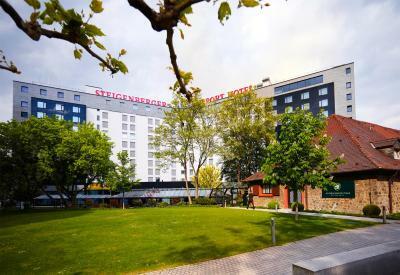 Steigenberger Airport Hotel Frankfurt This rating is a reflection of how the property compares to the industry standard when it comes to price, facilities and services available. It's based on a self-evaluation by the property. Use this rating to help choose your stay! 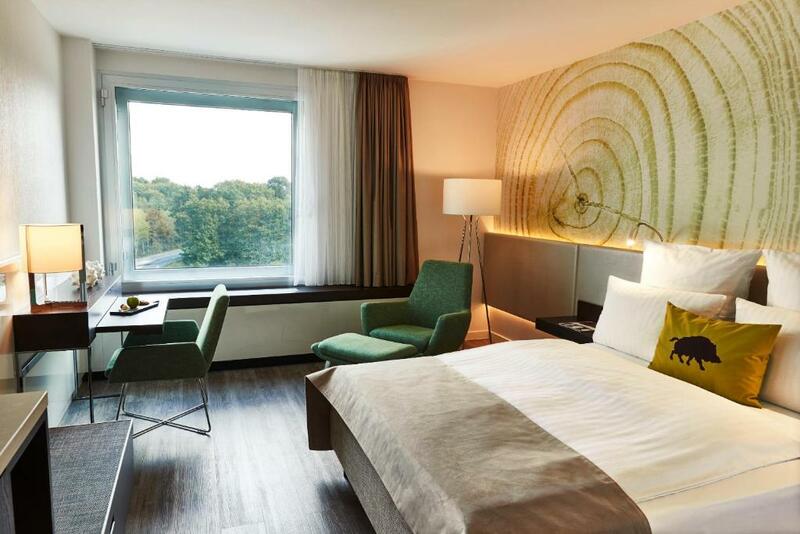 Just 2,950 feet from Frankfurt Airport, this hotel features a complimentary 2-way shuttle to/from the airport every 15 to 20 minutes around the clock. 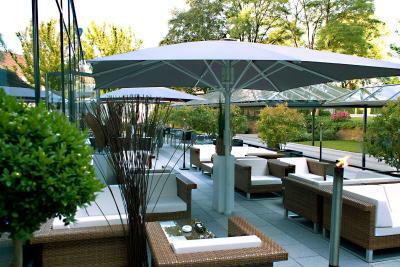 It also features a 1870 ft² upper-floor spa area with pool, a 24-hour bistro bar in the lobby, and free WiFi in all areas. 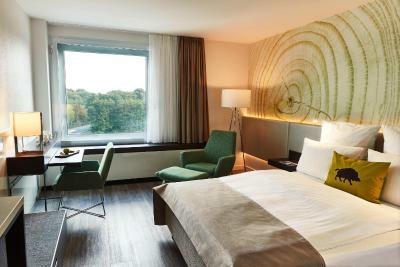 Spacious and soundproofed rooms with a flat-screen TV and mini-bar are offered at the Steigenberger Airport Hotel Frankfurt. 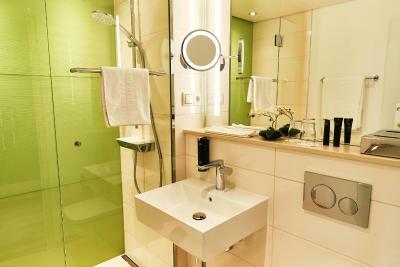 The private bathrooms each have a bath or a shower, hairdryer and toiletries. Guests additionally receive a complimentary bottle of water upon arrival. A quick check-in and check-out are helped by the free shuttle service to and from the airport. 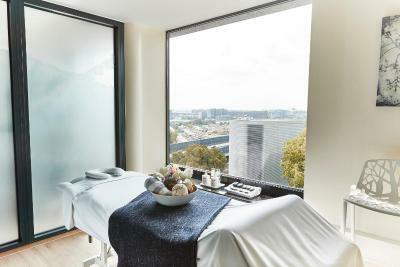 The indoor pool, fitness center and sauna area of the Steigenberger's 9th floor spa area are free for guests to use and features a view of the airport. 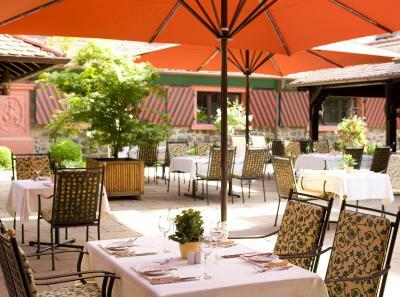 The hotel is next to Frankfurt's city forest and just a short shuttle-bus ride from the airport's train station. From here, Frankfurt's city center can be reached in 12 minutes. 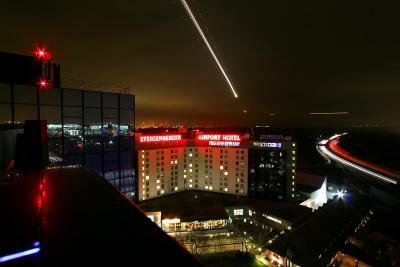 When would you like to stay at Steigenberger Airport Hotel Frankfurt? 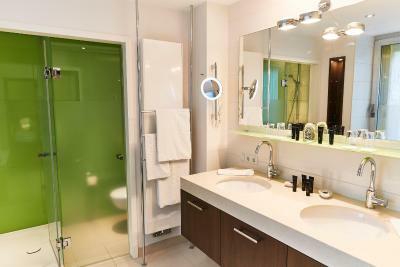 Bright room with a contemporary design in restful colors. 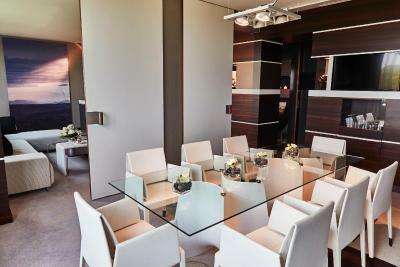 It features a Nespresso coffee machine, large desk and a flat-screen TV. 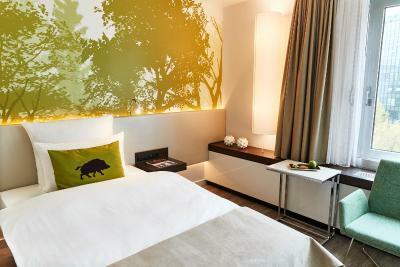 This room also offers forest views and a spa shower. High-speed Wi-Fi and 1 bottle of water are free of charge. 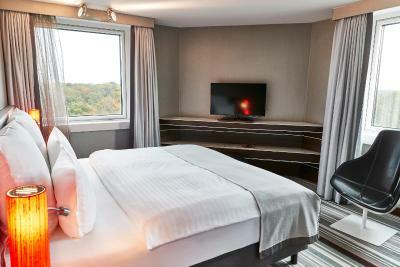 This room comes with a separate check-in and out service. 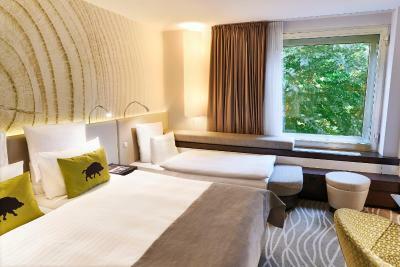 Free early check-in from 10.00 and late check-out until 15.00. This comfortable studio includes tea/coffee-making facilities, a desk and a flat-screen TV. Standard Wi-Fi is free for guests. 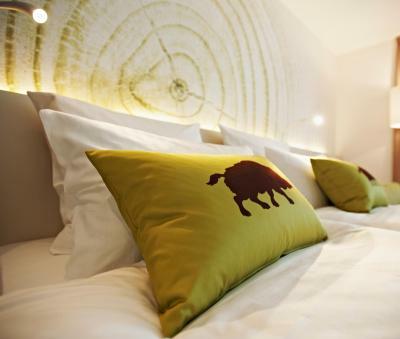 More comfort for your personal well-being is awaiting you in our 45 sqm Junior suites. 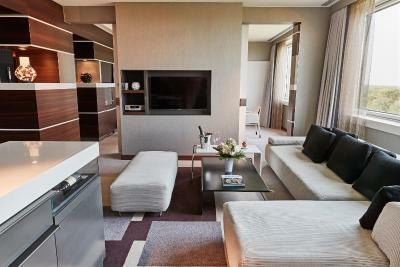 An integrated living area as well as all the luxury features of our Executive Room with a Nespresso coffee machine, a large desk and a flat-Screen TV. 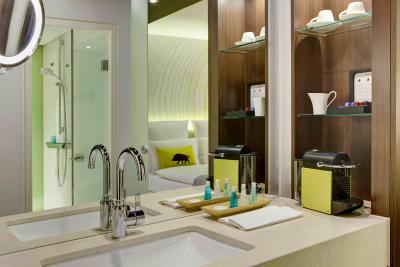 This single room features a mini-bar, electric kettle and soundproofing. 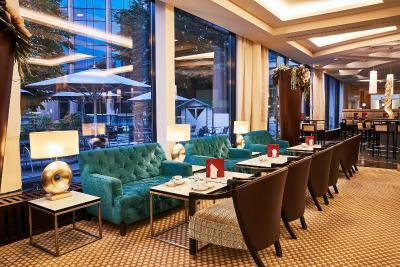 House Rules Steigenberger Airport Hotel Frankfurt takes special requests – add in the next step! 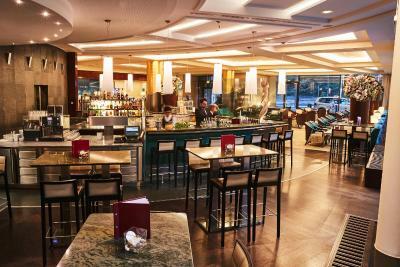 Steigenberger Airport Hotel Frankfurt accepts these cards and reserves the right to temporarily hold an amount prior to arrival. The 90's room decor, a bit outdated in contrast with the lobby, which is very nice and modern. Some of the plug outlets didn't work. The hotel can use a little modernization. No usb ports. Wifi was spotty. 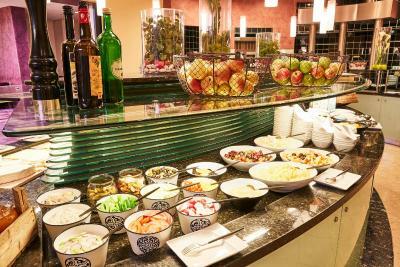 Breakfast was amazing and the service was excellent. The rooms were cold as the aircon didn’t allow the room temperate to go past 20 degrees. But thankfully staff game me. Blanket and a heater when I asked. Luxury hotel- I only stayed there for one night but would definitely stay again. The free 24 shuttle from the airport made this hotel a winner. I ordered by food and after 15 minutes the waiter came back to say he had forgotten what I had ordered. I mentioned this when my food finally arrived and was given a complimentary drink. The sign posting for the car park was poor from the direction I arrived. The location not too close from the airport since it is a transit hotel. Very basic and over price for a transit hotel. The online check in and check out procedure wasn't as smooth as other hotels but then again at the time it was in a test phase. Staffs was very kind and great! Atmosphere is great. Very clean, looks nice, comfortable stay. 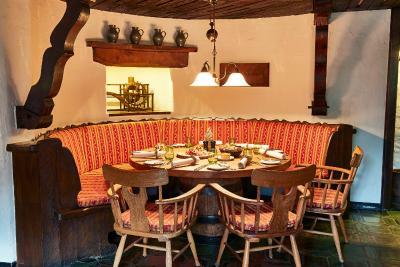 Room, staffs in restaurant and frond desk. 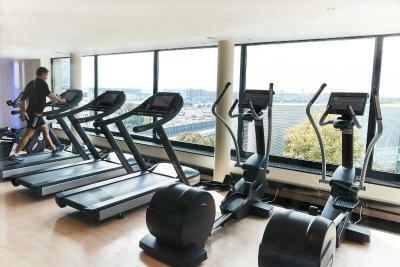 The hotel is very close to the Airport and the shuttle service to it excellent. We could use the shuttle also for visiting Frankfurt, by getting first to the Airport and from there, with the S-Bahn, to downtown. The hotel has an oldish-type class, not unpleasant. The staff is highly motivated, but not always very quick. The only annoying thing for me was getting 4 or 5 emails for a 2 night stay - including prompts for breakfast upgrade. Also, even though I tried putting the temperature to the max setting, the air conditioner was blowing barely warm air. Although cold-ish rooms seem common in Germany, so bit specific to this hotel. The bed was great, the shower was amazing, the internet was stable, the shuttle was super convenient.